From director Joel Schumacher ("Phone Booth," "A Time to Kill") comes this big-screen adaptation of Andrew Lloyd Webber's smash-hit stage musical! The Phantom, a disfigured musical genius, haunts the catacombs beneath the Paris Opera, waging a reign of terror over its occupants. He takes an interest in a young singer and, through tutelage and terror, helps her rise to stardom, only to see her fall in love with a handsome young man. The Phantom vows revenge and kidnaps her to be his eternal bride, but ultimately is transformed by the compassion of the young woman, and the love she feels for her young man, making the ultimate sacrifice in order that she may live and be happy. 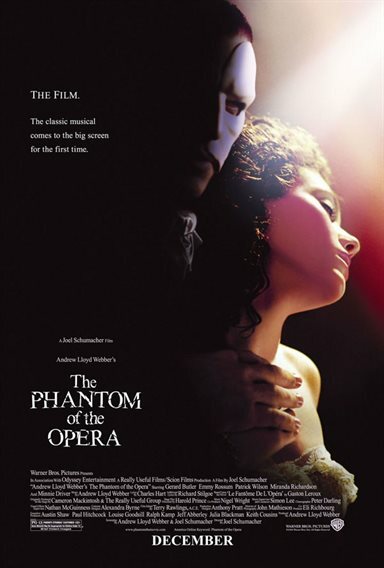 Download The Phantom of the Opera in Digital HD from the iTunes store. The Phantom of the Opera images are © Warner Bros.. All Rights Reserved.